Almost anyone of any age can learn about keeping bees successfully – all it needs is some basic knowledge and commitment to ensure the well-being of your bees. You’ll need to commit a certain amount of time each week from March to November to ensure that your hives and their occupants remain healthy and you will need to be capable of lifting and moving parts of the hive around during inspections. Whilst this can mean quite a lot of effort during the harvest moving frames full of honey, we are a friendly bunch and there are always other beekeepers around who can help out when required. 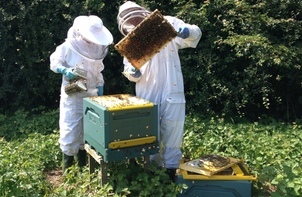 New beekeepers joining our association are usually assigned a more experienced mentor based locally who can provide advice and assistance where required. We at the Fleet BKA have members of all kinds of ages and backgrounds. We have a number of more junior members who gained their initial beekeeping qualifications at 12 years old and at the other end of the scale we have more mature members with over 50 years of invaluable beekeeping experience that they share freely. As members of the British Beekeepers Association, we encourage our members to take the BBKA’s internationally recognised qualifications which covers both theory and practical subjects. Beekeeping is also a hobby that can be enjoyed by those with various physical and sensory challenges with a little bit of careful thought in advance into various practical considerations such as how best to conduct teaching sessions, the appointment of an appropriate beekeeping “buddy” etc. In fact deafness or even complete blindness does not prevent anyone from becoming a highly competent beekeeper with a little assistance. Does it take much time? 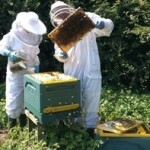 Beekeeping is a largely seasonal hobby and the amount of time required to manage colonies varies throughout the year. Between March and September an inexperienced beekeeper will probably spend about an hour per colony per week on various tasks, with those who have been keeping bees for a year or so reducing that time by half. During this time beekeepers inspect their hives looking for signs of potential swarming, disease, the amount of stores and general well-being. Between Late April and July, beekeepers will need to inspect their colonies for signs of swarming on a regular basis each week otherwise swarming colonies could cause a nuisance to neighbours or someone else, as well as causing a potential loss of honey from the harvest later in the year. From October to February colonies require very little attention as the bees within them are generally only active when there are flowering plants to forage. During this time, winter work is generally limited to the maintenance of equipment which takes up very little time overall. It’s also the time of year where we run a series of winter lectures to provide keen members with more theoretical information on various aspects of this fascinating pastime! Beekeeping is not an expensive pastime and we at Fleet Beekeepers do all we can to reduce costs as much as possible, especially for new beekeepers. We strongly encourage those without any beekeeping experience who are considering joining us to come along for a personal introduction to bees sometime in the spring or summer with a senior member of our association where we supply a bee-suit and let them experience bees up close in a suitably safe environment. Those who join our Bee-ginners course only need to by a bee-suit initially at a cost of between £60-£120 plus strong rubber gloves with a gauntlet (£10). Both of these can be obtained online or at various bee-related shows and events and we at the FBKA can arrange a discount of between 10-20% for our members. These discounts can also be extended to other equipment such as bee hives and in addition the FBKA has it’s own shop selling all the consumables any beekeeper will ever need at a lower cost than most normal outlets, passing any profits back into the Association for the benefit of all members. A new beehive can be purchased for about £100-£600 with hives made from polystyrene at the cheaper end of the scale growing in popularity over the much more expensive Western Cedar hives. To this you would need to add the cost of a beesuit and other equipment which probably costs another £150. All of this can be purchased through the Associations own shop which stocks all you will need at greatly reduced prices. Bees can either be purchased separately or as a member you can join the list to receive a swarm collected by one of our more experienced beekeepers. Remember – there is always a huge demand for local honey, so you could become self-financing quite quickly! Can I keep bees in my garden? Whilst beehives can be kept in almost any sheltered area where they are away from the general public, they need around 1M of clear space around the hive to provide easy access to the beekeeper and the bees need a clear pathway in front of the hive to give them a clear flight-path to freely fly in and out at will. Some beekeepers can place one or two colonies at the bottom of a large garden, but don’t risk problems with family or neighbours who may not share your enthusiasm, so please be responsible. We are quite happy to discuss your personal situation on the phone or over a cup of tea during a personal visit to those thinking of becoming beekeepers and joining our association. Generally speaking, bees fly at a height of 3 metres or more and are therefore usually invisible to most people when actually in flight. In a restricted location, many beekeepers place the entrance of the hives close to a screen or hedge. This encourages the bees to fly straight up and over the screen to their normal cruise height, making them much better neighbours! Many local farmers and landowners welcome having colonies of bees placed near their flowering crops and the Fleet Beekeeping Association has access to a number of suitable locations as well as having a number of our own apiary sites located across the district where members hives can be securely located. How do I learn beekeeping? Although some commercial companies offer weekend courses, it soon becomes apparent that practical knowledge is the key to becoming a good beekeeper. It’s a subject that simply cannot be learnt from a book without potentially harming yourself and those around you as well as mistreating any bees you may have. That’s why we at Fleet Beekeepers run a “Beekeeping for Beeginners” course each year starting in February with seven weekly evening theory sessions where you will start to learn the basics. After that we put a lot of emphasis into holding regular bee handling sessions for both new and novice beekeepers through the spring and summer in our dedicated training apiary containing docile bees. At some time in late summer, we will help our newest members obtain a suitable colony of bees for themselves that they can build up through the rest of the summer and into the winter with sufficient stores to take them through into the following spring. We also implement a buddy scheme pairing new beekeepers with those who have more experience to help them get through the first few uncertain years. We find it really helps new beekeepers to have someone with more experience nearby who can tell you the answer to such questions as “Why are my bees doing that?”and “How do I find the Queen?” over the phone or whilst chatting over a coffee. Although there has been a recent move towards “natural beekeeping” recently, experience shows that bee colonies still need care and occasional intervention with organic treatments to mitigate the impact of Varroa mites and other virulent infections that can spread to other colonies very rapidly. Our teaching promotes something we call “benign beekeeping” where we encourage new beekeepers to work with the bees in a sympathetic style, ensuring their health and well-being at all times over the desire to maximise any potential honey harvest at all costs. The simple answer is unfortunately yes! All beekeepers will get stung occasionally, despite wearing full suits, veils and gloves. It certainly hurts, but most people recover very quickly. Even those allergic to bee stings can sometimes keep bees subject to suitable medical advice. We encourage beekeepers to wear thin vinyl or latex gloves to minimise the transfer of any potential disease from one hive to another. These are fairly sting proof – but not completely! This in our experience tends to make beekeepers careful handlers of bees, minimising the risk of any potential stings through a combination of gentleness and patience.